As the limo pulls up in front of the wedding venue and restaurant Cambridge Mill the bride steps out, helped by her maid of honour, her veil on her head, her train long and towards the converted grain mill she goes. The first thing she will encounter is the stone staircase which leads up to the front door. This grand entrance frames the first impression of the event venue which hosts over 250 weddings per year. 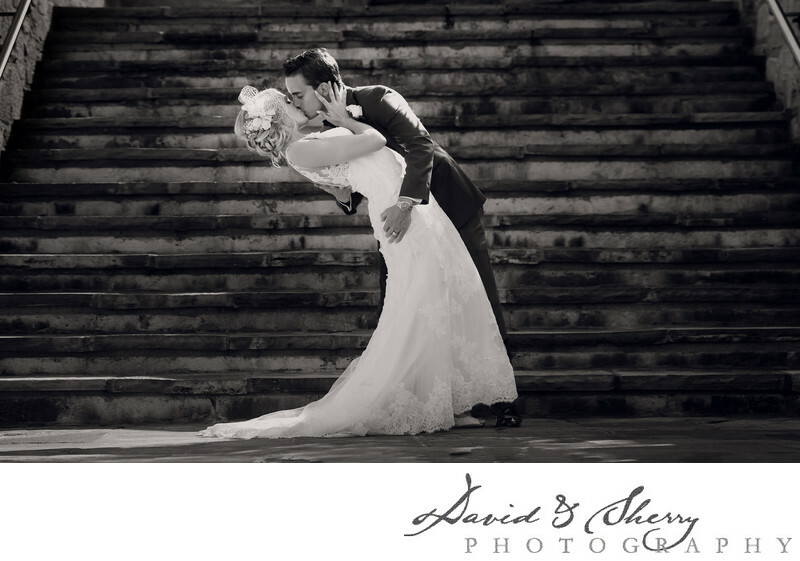 When it is time, after the nuptials have been said and the first kiss has taken place it is time to take some beautiful wedding portraits. The grand staircase is a great place to start as it allows enough space and vertical dimension to include the whole bridal part no matter how big it is. This photo of the newly married couple with the man dipping the woman and giving her a kiss in black and white is a great picture and one that would be appreciated for all weddings. The photo locations throughout the property from the park next door to the staircase on the exterior of the building to the balcony on the top floor Cambridge Mill offers wonderful locations for portraits.